Stefano Lubiana’s parents migrated to Australia from Italy and started a wine-making business in South Australia’s Riverlands, but when he married Monique and they chose to follow the family business, they knew it was Tasmania they wanted to head to. “It was too hot; we saw that it was too resource intensive to grow grapes and make wine, too great an impost on the environment. 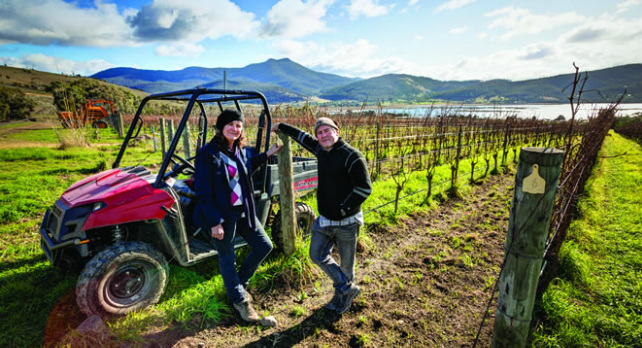 Climate change means that Tassie’s warming up, so heading south was a no-brainer for us” says Monique of their family winery in Granton, just north of Hobart. 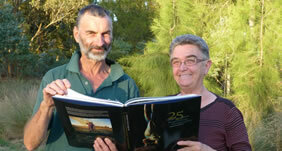 “When we’re not making wine, I love learning about alternative health and Stefano has bee hives and grows mushrooms. He’s very innovative - we could have put a conventional cellar in here - but we had to buy electricity to cool and humidify it. Instead, they received a grant from money raised by the carbon price to install a state-of-the-art thermal mass underground cellar. “This way, we get humidity from the earth, so we can control the humidity and we have a much lower environmental impact. “You have to keep costs down, we need to use innovative methods. Our grant from the Clean Tech Program is absolutely doing good things for us. “We’re environmentally conscious and so are our customers, so this really was a no-brainer. “We’re saving $20,000 a year in electricity prices, and we’re gaining $40,000 in better wine and less evaporation, so we’ll have paid back our share in only a few years. It was a big project that the grant really helped get off the ground.